On Monday afternoon, the North Carolina State Wolfpack will face off against the Vanderbilt Commodores in the 15th edition of the Music City Bowl. On the surface, this may appear to be another superfluous, uninteresting bowl game, pitting a middling ACC team against a middling SEC team. 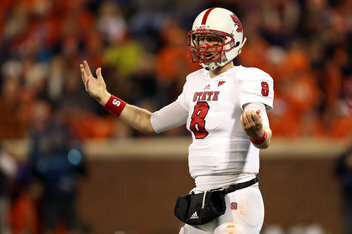 However, there is at least one player that should compel you to watch this game: NC State quarterback Mike Glennon. Who is Mike Glennon? Well, if you’re a fan of the Chiefs, Cardinals, Bills, or Jets (or any other team with a QB need) he might just be your starting quarterback next season! Glennon, a 6-7 quarterback from the DC area, has had by no means an amazing career at NC State; he was stuck behind Russell Wilson for his first two years after redshirting, and over the past two years he’s put up good but not great statistics while leading the Pack to two bowl games. So what makes him potentially the top quarterback selected in the 2013 draft? Regardless of the numbers he has put up to this point, scouts love him. They always have – coming out of high school, Glennon was considered a top 5 QB in his class by all 3 major recruiting websites (Rivals, Scout, ESPN). While the hype died down as he waited for three years behind Wilson, it has started to build once again as draft season draws near. Earlier this week on SportsCenter, Mel Kiper tabbed Glennon as most likely to be the first QB off the board on draft day. This followed Mike’s selection to the Senior Bowl All-Futures team over Matt Barkley and Geno Smith, two of his more notorious contemporaries. This isn’t to say that the numbers aren’t any good either. He’s thrown 61 TDs over the past two seasons – and try naming one of the receivers who caught those passes. Glennon also has some nice situational splits, including a 191.8 passer rating on 18 fourth down throws this year. It’s easy to see why an NFL team would take him over Barkley or Smith. When you look at a scouting profile of Matt Barkley, you see a slightly more experienced Mark Sanchez. It’s startling how similar the two players are. As for Geno, it will be easy for people to chalk up his numbers to his system, rather than his actual ability – quarterbacks who have excelled in Dana Holgorsen’s offense in the past include Brandon Weeden, Case Keenum, and Graham Harrell. Notice a trend? At this point in the process, nobody – not Mel Kiper, or Todd McShay, or even me – has any idea which quarterback will hear his name called first on April 25th. However, if you see it as only a two-man race, you’re underestimating Mike Glennon.